There are plenty of inexpensive target or hunting loads for the AK and SKS rifles, but not so many for potential defensive use. 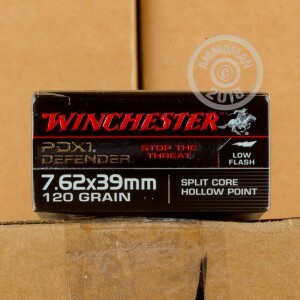 If the 7.62x39mm is your cartridge of choice for a possible emergency, you can count on this Winchester PDX1 Defender ammunition. 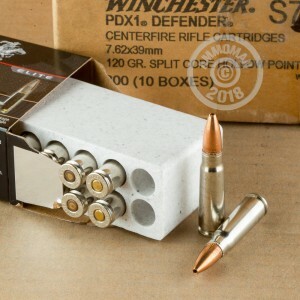 These cartridges fire a 120 grain dual core jacketed hollow point bullet at a muzzle velocity of 2,365 feet per second. The heavy rear core helps the front penetrate and expand more reliably on contact with the target. Low flash propellants help ensure reduced blinding for the user and make accurate fire easier. 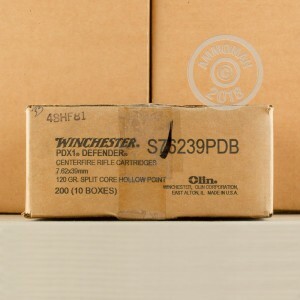 Winchester ammunition is loaded in Oxford, Mississippi and uses non-corrosive Boxer primers. These rounds use nickel-plated brass cases.